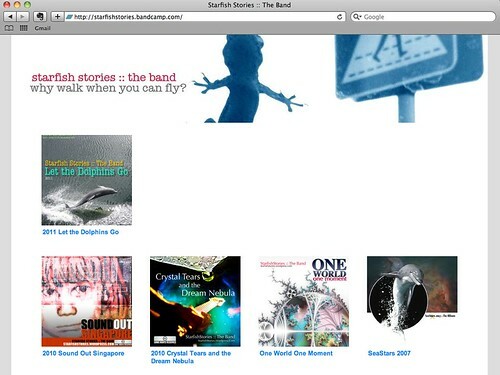 Uploaded the 2011 Let the Dolphins Go album at our Bandcamp page. And created a new banner. Adrian and I met for breakfast. One of our rare face-to-face meet ups. We talked about family, kids, wives, parents, work, life, music, Tagore. Not necessarily in that order. But close. We reminded ourselves we didn’t plan for have an album. It was an attempt at expression, we realised. Music happened to be a suitable conduit. The format of working using computers and email suited our lifestyles. Forming the “band” and publishing the album was a convenient end-result of our collaborative process. But subsequently, it seemed the process of technical refinement took over the expression. While the albums after SeaStars 2007 were technically more proficient (relatively speaking), they lacked that clean-cut simplicity of the first. 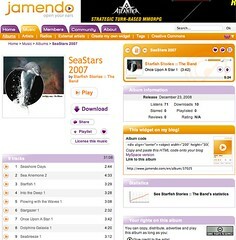 Adrian was more blunt: SeaStars 2007 was kinda crappy as an album. I thought so too, knowing what we know now 🙂 Still, we thought there was something in there that was uniquely our styles. Writing this now, it occurred to me that working on SeaStars 2007 was like discovering we could hear. The subsequent albums was like putting on better earphones, with crisper sounds. But being able to hear better didn’t necessarily mean we were really listening. Kinda like what Adrian wrote here, about being poor in spirit. And now we think we’re continuing on that journey more consciously. Trying to really listen this time. And to have fun while continuing to find ourselves. p.s. On this renewed musical “roadtrip”, we have another friend on board. More to be revealed, soon. Just updated to the Motion theme from WordPress.com. This was the previous ‘Greyzed’ theme. 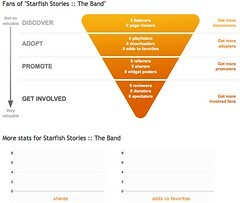 Yes, you among the 124 people who’ve joined the official Starfish Stories FB fanclub (and were too lazy to unsub). Why are these two jokers releasing two albums in the same year, you ask? Adrian and Ivan have even teamed up with a vocalist named I-Ling (this isn’t a typo; it’s on her NRIC). You can hear her at the first track. She wrote the lyrics too. The rest of the tracks are instrumentals (the guys didn’t want to spoil a good thing and wisely refrained from singing). In spite of what people tell them, Adrian and Ivan plan to continue making music. Their 5th CC-licensed album is slated for release in early 2011. Many famous guitars brands carry the name of their creators, and in the process becoming generic brand names. Like “Les Pauls” and “Paul Reed Smith”. It shouldn’t surprise me to hear Mr. Paul Reed Smith talk about his PRS guitars. But for some reason it does. To make more art with. As you can tell from the absence of posts, Adrian and I have been busy. With our day jobs and stuff. Musically, I’m still keeping myself productive by hanging out at ccMixter.org. “Feel It Burning (ft. Snowflake)” by Ivan Chew, featuring vocal and piano tracks originally posted by Snowflake. 2009 – Licensed under Creative Commons Attribution (3.0). Click here for how to give credit and other conditions. I think around end Sept, Adrian and I would have more time. I might get over my procrastination and work on tweaking the sounds for the rest of the Crystal Tears album. Just signed up for SOFT – www.soft.com.sg – probably THE music forum in Singapore. Hey everyone, I’ve heard about www.soft.com.sg but only signed up today. Someone told me most people here are in the mid-20s. I’m not sure if at 37 I’m the oldest guy here. 2) Started on the guitar at 18 years old. More to impress the girls but soon got REALLY interested in guitars. Discovered more about electric guitars and gadgets. However, am never formally trained in music. 5) We decided our music wasn’t too bad (my wife didn’t cover her ears). Plus we didn’t have to spend any money, thanks to the Internet. So we continued as a team and gave ourselves a band name. And we released our 2nd album early this year. 6) Currently working on our 3rd music album. Probably going to release it this year. 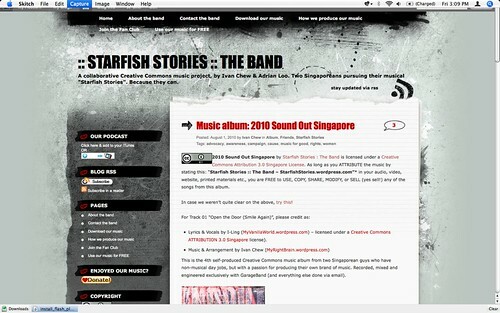 All our music is released under the Creative Commons license: http://creativecommons.org/licenses/by/3.0/sg/. Meaning, anyone is free to use, distribute, share, remix… the ONLY requirement is to credit the band in the way we state (e.g. name and URL). No payment required — although if they decide to pay our of the goodness of their heart… ahem. And now you probably know why I call myself “Rambling”. Very informative video tutorials from Dave Weiner‘s Riff Of The Week series. Even though I use so-called “virtual equipment”, i.e. software instruments and digital simulations of amps and effects, I found the tutorials a great help in boosting my understanding of recording fundamentals. Increasingly, digital music interfaces are modeled after physical ones. For instance, in GarageBand ’06 and ’08, when you adjust a stomp box effect setting, you adjust the slider. On a real stomp box, you turn a knob. In GarageBand ’09 (I’ve not tried it but saw it at demos like this one), the interface shows a stomp box and you turn a knob like the real physical thing. Our first fan club was started by a fan “in the form of a monkey” – her words, not ours! 🙂 But that club was for our first album. Now that we’re a band, here’s our Facebook fan club. We’ll use it more like a mailing list. Updates and stuff for our adoring fans (yeah, right). At most one email a month, in case you’re wondering. I think once in two months tops, realistically. Go post on the fan club wall or something. Adrian told me about Jamendo.com some time ago. Was pleasantly surprised to find lots of radio-friendly CC-licensed music. Before that, I decided to create an email account for the band (details at our Jamendo profile page). Jamendo is a social networking site for musicians: upload your songs (singles or full albums), license it under CC, share it, let people discover you, discover musicians you like, post comments/ review their music. You can also see a consolidated page of the comments you’ve posted. The site also recommends stuff that you might like (unobtrusively, I might add). They also offer stats on your music (no. of downloads, plays etc). You can offer friendship requests and receive requests as well. Gotta admit I’m a bit skeptical about “I wanna be your friend” requests, ‘cos I think some musicians who offer friendship often do it to publicise their music rather than make friends. Still, it’s a way to discover other people’s music. I’m glad Adrian told me about Jamendo. 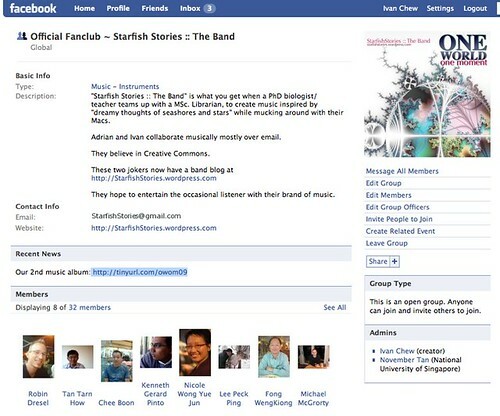 It’s a very well conceived social networking site for musicians, based on a CC-licensing concept. I like it waaaay better than MySpace music.